A commitment to making use of new technology and improving efficiency is a key part of the business philosophy of 25-year-old Lynn Argo, who is making her mark on the pig industry. 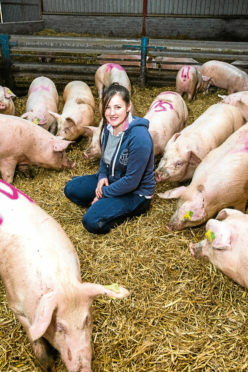 Miss Argo, of Harvieston Farm, Catterline, Stonehaven, has been working full-time in her family’s pig business since she graduated in 2014 and, along with her father, David, she is on a mission to drive the business forward. The company – D.W. Argo – runs two main pig units with 1,800 sows and 16 members of staff between them. These are Brigstanes, which is located a mile away from the home farm, and Ellismoss, which is near Kinellar. Ms Argo is responsible for looking after approximately 5,000 fattening pigs which are out on “bed and breakfast” agreements all over Scotland. “I spend quite a lot of time on the road, checking the health of these pigs, selecting pigs for slaughter and organising transport at these outlying units,” she said. As part of her drive to improve the business, she is a member of the management committee for the pig monitor farm group, supported by Quality Meat Scotland and Opportunity North East. And as a result of learning from other farmers in the group, she made the decision to invest in a new Pocco wet feed system for pigs from 7kg to 35kg. “This mixes the feed in small batches and feeds little and often, keeping the feed fresh all the time,” said Miss Argo. She said the family was also keen to keep more pigs at home and are in the process of building two sheds at Brigstanes, with the capacity for 5,280 finishing pigs. The first pigs are set to go into the units in the next couple of months.